One of the most critical elements of close quarter shooting is quick target acquisition, a staple-feature of the Sightmark Ultra Shot Plus Flat Dark Earth Reflex Sight. With a crisp, parallax corrected, scratch-resistant lens system, unlimited eye relief, multiple reticle options and 120 MOA windage/elevation adjustability, accurate shooting at close range has never been more forgiving… or accurate in less than desirable conditions or positions. The feature-rich Ultra Shot Plus Reflex Sight, now offered in a flat dark earth finish, boasts numerous red/green dots at 3 – 5 MOA with 30 – 50 MOA crosshair/circle options, as well as red/green illumination complete with 5 brightness settings for each color. The Ultra Shot Pro’s durable cast-aluminum alloy housing and protective shield, .50-cal. recoil performance, IPX4 weatherproof rating and lifetime warranty ensures flawless all-day operation, year after year and the peace of mind in knowing if something does go awry, Sightmark is there to get you back on target. 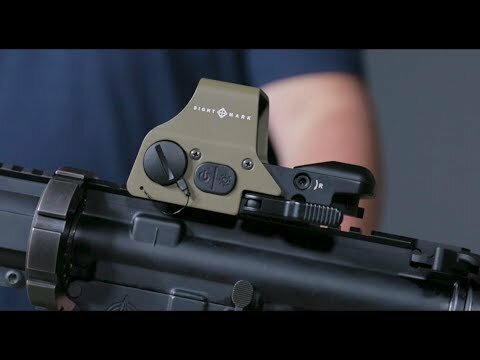 The Sightmark Ultra Shot Plus Reflex Sight is powered by a single CR123A battery with a battery lifespan of 180 hrs. on high to 2,000 hrs. on low and includes a CR123A battery, neoprene sight cover, adjustment tools and an operation manual.